R. Luther discovered asteroid #26 Proserpina. H. Goldschmidt discovered asteroid #70 Panopaea. J. H. Metcalf discovered asteroid #638 Moira. Amy Johnson, the first woman to fly solo from England to Australia, took off in a single engine Gypsy Moth from Croydon on her historic flight. H. Van Gent discovered asteroid #1693 Hertzsprung. Sputnik 3, launched on 5 May 1958, was an automatic scientific laboratory spacecraft, conically shaped and 3.57 m long. The twelve scientific instruments provided data on pressure and composition of the upper atmosphere, concentration of charged particles, photons in cosmic rays, heavy nuclei in cosmic rays, magnetic and electrostatic fields, and meteoric particles. The Earth's outer radiation belts were detected during the flight. The spacecraft remained in orbit until 6 April 1960. NASA launched Mercury Redstone 3 "Freedom 7" with astronaut Alan Shepard aboard, the first American into space, on a 15 minute suborbital flight. Mercury Redstone 3 (MR-3, commonly known as "Freedom 7") was the first flight of an American rocket with a human on board, occurring twenty-three days after Yuri Gagarin's orbital flight of Vostok 1: It carried Alan B. Shepard, Jr. into space on 5 May 1961. The objectives of MR-3 were to: (1) familiarize man with a brief but complete space flight experience, including the lift-off, powered flight, weightless flight (approximately 5 minutes), re-entry, and landing phases of the flight; (2) evaluate man's ability to perform as a functional unit during space flight by demonstrating manual control of spacecraft attitude before, during, and after retrofire and by use of voice communications during flight; (3) study man's physiological reactions during space flight; and, (4) recover the astronaut and spacecraft. The Redstone booster performed well, with some vibrations. After separation, Shepard exercised manual control of the spacecraft in both the "fly-by-wire" and manual proportional modes. The attitude control system operated nominally, with few thruster fuel leaks. Re-entry and landing were accomplished without any difficulty. The Mercury capsule lacked a window through which Shepard could view his surroundings, but a periscope allowed him views of the outside during the pre-launch and weightless phases of the mission. During the flight, the spacecraft attained a maximum velocity of 8,200 km/hour (5095 mph) and an altitude of 186.4 km (115.8 miles). The capsule landed 483 km (300 miles) downrange from Cape Canaveral, at 75 degrees 53 minutes west longitude, 27 degrees 13.7 minutes north latitude in the Atlantic Ocean. Shepard experienced a maximum force of 6g's during booster acceleration and slightly less than 12g's on re-entry. The flight's duration was 15 minutes and 22 seconds, with weightlessness lasting for about 5 minutes. 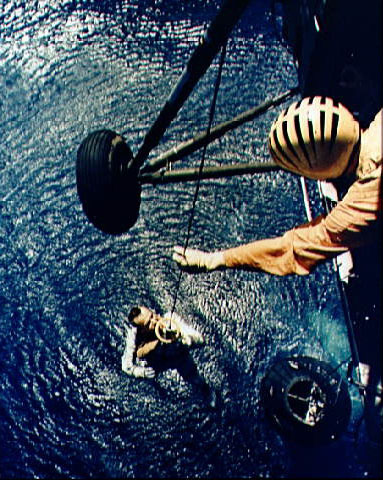 After splashdown, the Mercury capsule and its pilot were returned by helicopter to the aircraft carrier USS Lake Champlain. Just three weeks following this first successful manned mission, President Kennedy addressed Congress and set the nation's goal to send a man successfully to the Moon and back before the end of the decade. E. Bowell discovered asteroids #2659 Millis and #3023 Heard; and C. Shoemaker discovered asteroids #2686 Linda Susan, #2748 Patrick Gene, #3107 Weaver, #3375 Amy and #3689 Yeates. NASA launched Magellan, the Venus orbiter radar mapping mission, carried into space aboard the shuttle Atlantis. Magellan, launched 4 May 1989 aboard NASA's shuttle Atlantis, was a unique mission, being the first dedicated US mission to study the surface of Venus in detail, using Synthetic Aperture Radar (SAR). Because Magellan was intended to be a low cost mission, major components of the spacecraft were obtained from flight spares from other programs including Galileo, Viking, Voyager, Mariner, Skylab, Ulysses, and even the shuttle. Designed as a follow-up to the mapping portion of the Pioneer Venus mission, Magellan's purpose was to: (1) obtain near-global radar images of Venus' surface with a resolution equivalent to optical imaging of 1 km per line pair; (2) obtain a near-global topographic map with 50 km spatial and 100 m vertical resolution; (3) obtain near-global gravity field data with 700 km resolution and 2-3 milligals (1 gal = 1 cm/s**2) accuracy; and, (4) develop an understanding of the geological structure of the planet, including its density distribution and dynamics. Magellan reached Venus and went into orbit on 10 August 1990. The initial phase of the mission (Cycle 1) began shortly after orbital insertion about Venus and lasted for eight months (15 September 1990 through 15 May 1991). During this cycle, Magellan collected radar images of about 84% of the planet's surface. Cycle 2 lasted from the end of cycle 1 until 15 January 1992, during which the spacecraft obtained images of the southern polar region and filled numerous gaps left in the cycle 1 information. Cycle 3 began on 24 January 1992 and lasted until 15 September 1992, during which the remaining gaps from cycle 1 were filled in as well as providing data which, in combination with earlier data, could be used to produce stereo images of the surface. Cycle 4 lasted from 15 September 1992 to May 1993 and consisted of gravity data acquisition from the elliptical orbit. 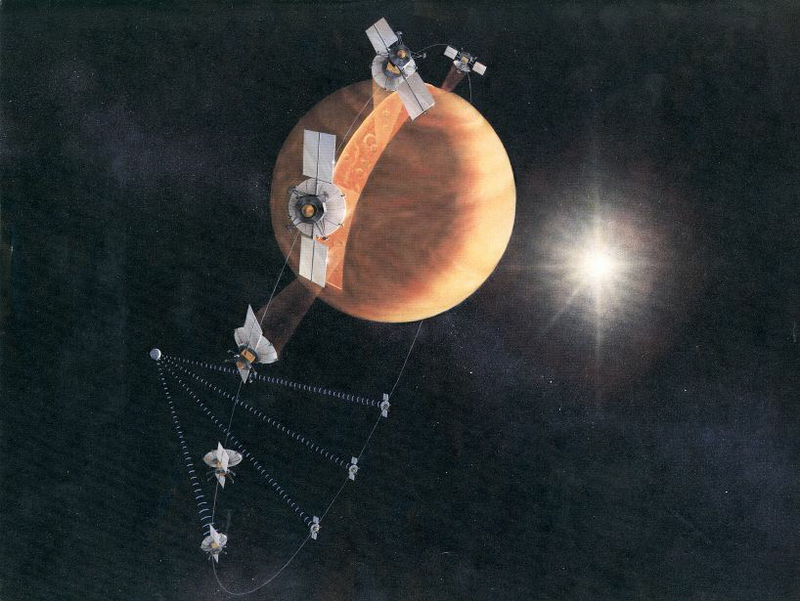 An aerobraking maneuver, in which Magellan was dipped into the Venus atmosphere to shed orbital energy and bring the spacecraft into a more circular orbit, was performed from 24 May until 2 August 1993. At the end of aerobraking, the orbit had a periapsis of 180 km, an apoapsis of 540 km, and a period of 94 minutes. Cycle 5 was used to acquire gravity data from this orbit from 3 August 1993 until 29 August 1994, giving high-resolution gravity data for about 95% of the planet. In September 1994, the Windmill experiment took place, in which the solar panels were tilted at an angle so that atmospheric drag put a torque on the craft, which could be measured to give information about the atmospheric density at different altitudes. Magellan began its final descent into the atmosphere of Venus on 11 October 1994. On 12 October 1994, radio contact with Magellan was lost, and the spacecraft presumably burned up in the atmosphere on 13 or 14 October 1994. By the end of the mission, over 99% of the planet's surface had been mapped by RADAR with a resolution ten times better than that obtained by the earlier Soviet Venera 15 and 16 missions. The US BMDO satellite Clementine left Lunar orbit on a mission intended to take it past the near-Earth asteroid 1620 Geographos. Clementine was a joint project between the Ballistic Missile Defense Organization (BMDO, nee the Strategic Defense Initiative Organization, or SDIO) and NASA, launched 25 January 1994. The mission's objectives were to test sensors and spacecraft components under extended exposure to the space environment, and to make scientific observations of the Moon and the near-Earth asteroid 1620 Geographos. The Geographos observations were not made due to a spacecraft malfunction. The Lunar observations made included imaging at various wavelengths in visible, ultraviolet and infrared ranges, laser ranging altimetry, gravimetry, and charged particle measurements. These observations were for obtaining multi-spectral imaging of the entire Lunar surface, assessing the surface mineralogy of the Moon and obtaining altimetry from 60N to 60S latitude, and gravity data for the near side. There were also plans to image and determine the size, shape, rotational characteristics, surface properties, and cratering statistics of Geographos. Clementine carried 7 distinct experiments on-board: a UV/Visible Camera, a Near Infrared Camera, a Long Wavelength Infrared Camera, a High Resolution Camera, two Star Tracker Cameras, a Laser Altimeter, and a Charged Particle Telescope. Its S-band transmitter was used for communications, tracking, and in the gravimetry experiment. The mission had two phases. After two Earth flybys, a Lunar orbit insertion was executed approximately one month after launch. Lunar mapping then took place over two months, in two parts. The first part consisted of a five hour elliptical polar orbit with a periapsis of about 400 Km at 30 degrees south latitude and an apoapsis of 8300 Km. Each orbit consisted of an 80 minute Lunar mapping phase near periapsis and 139 minutes of downlink at apoapsis. After one month of mapping from this first orbit, the orbit was rotated to a periapsis at 30 degrees north latitude, where it remained for one more month. This allowed global imaging and altimetry coverage from 60 degrees south to 60 degrees north, over a total of 300 orbits. After a Lunar/Earth transfer and two more Earth flybys, the spacecraft was to head for Geographos, arriving three months later for a flyby, with a nominal approach closer than 100 Km. Unfortunately, after the first Earth transfer orbit maneuver was performed on 5 May 1994, a malfunction aboard the craft (7 May 1994) caused one of the attitude control thrusters to fire for 11 minutes, using up its fuel supply and causing Clementine to spin at 80 rpm. Under those conditions, the asteroid flyby could not yield useful results, so the spacecraft was put into a geocentric orbit passing through the Van Allen radiation belts to test the various components on board. The mission ended in June 1994 when the power level onboard dropped to a point where the telemetry from the spacecraft was no longer intelligible. British film producer Ray Santilli unveiled his "alien autopsy" footage to a group of UFO researchers. The film is now widely regarded as a hoax. NASA's ISEE 3/ICE (International Sun Earth Explorer/International Cometary Explorer) official mission was terminated. The Explorer-class heliocentric spacecraft, International Sun-Earth Explorer 3, was part of the mother/daughter/heliocentric mission (ISEE 1, 2, and 3). The purposes of the mission were: (1) to investigate solar-terrestrial relationships at the outermost boundaries of the Earth's magnetosphere; (2) to examine in detail the structure of the solar wind near the Earth and the shock wave that forms the interface between the solar wind and Earth's magnetosphere; (3) to investigate motions of and mechanisms operating in the plasma sheets; and, (4) to continue the investigation of cosmic rays and solar flare emissions in the interplanetary region near 1 AU. The three spacecraft carried a number of complementary instruments for making measurements of plasmas, energetic particles, waves, and fields. The mission thus extended the investigations of previous IMP spacecraft. The launch of three coordinated spacecraft in this mission permitted the separation of spatial and temporal effects. ISEE 3, launched 12 August 1978, had a spin axis normal to the ecliptic plane and a spin rate of about 20 rpm. It was initially placed into an elliptical halo orbit about the Lagrangian libration point (L1) 235 Earth radii on the sunward side of the Earth, where it continuously monitored changes in the near-Earth interplanetary medium. In conjunction with the mother and daughter spacecraft, which had eccentric geocentric orbits, this mission explored the coupling and energy transfer processes between the incident solar wind and the Earth's magnetosphere. In addition, the heliocentric ISEE 3 spacecraft also provided a near-Earth baseline for making cosmic-ray and other planetary measurements for comparison with corresponding measurements from deep-space probes. ISEE 3 was the first spacecraft to use the halo orbit. In 1982, ISEE 3 began the magnetotail and comet encounter phases of its mission. A maneuver was conducted on 10 June 1982 to remove the spacecraft from the halo orbit around the L1 point and place it in a transfer orbit involving a series of passages between Earth and the L2 (magnetotail) Lagrangian libration point. After several passes through the Earth's magnetotail, with gravity assists from Lunar flybys in March, April, September and October of 1983, a final close Lunar flyby (119.4 km above the Moon's surface) on 22 December 1983 ejected the spacecraft out of the Earth-Moon system and into a heliocentric orbit ahead of the Earth, on a trajectory intercepting that of Comet Giacobini-Zinner. At this time, the spacecraft was renamed International Cometary Explorer (ICE). A total of fifteen propulsive maneuvers (four of which were planned in advance) and five Lunar flybys were needed to carry out the transfer from the halo orbit to an escape trajectory from the Earth-Moon system into a heliocentric orbit. The primary scientific objective of ICE was to study the interaction between the solar wind and a cometary atmosphere. As planned, the spacecraft traversed the plasma tail of Comet Giacobini-Zinner on 11 September 1985, and made in situ measurements of particles, fields, and waves. It also transited between the Sun and Comet Halley in late March 1986, when other spacecraft (Giotto, Planet-A, MS-T5, VEGA) were also in the vicinity of Comet Halley on their early March comet rendezvous missions. ICE became the first spacecraft to directly investigate two comets. ICE data from both cometary encounters are included in the International Halley Watch archive. Tracking and telemetry support were provided by the DSN (Deep Space Network) starting in January 1984. The ISEE-3/ICE bit rate was nominally 2048 bps during the early part of the mission, and 1024 bps during the Giacobini-Zinner comet encounter. The bit rate then successively dropped to 512 bps (on 9/12/85), 256 bps (on 5/1/87), 128 bps (on 1/24/89) and finally to 64 bps (on 12/27/91). As of January 1990, ICE was in a 355 day heliocentric orbit with an aphelion of 1.03 AU, a perihelion of 0.93 AU and an inclination of 0.1 degree. An update to the ICE mission was approved by NASA headquarters in 1991. It defined a Heliospheric mission for ICE consisting of investigations of coronal mass ejections in coordination with ground-based observations, continued cosmic ray studies, and special period observations such as when ICE and Ulysses were on the same solar radial line. By May 1995, ICE was being operated with only a low duty cycle, with some support being provided by the Ulysses project for data analysis. Termination of operations of ICE/ISEE3 was authorized 5 May 1997. In 1999, NASA made brief contact with ICE to verify its carrier signal. On 18 September 2008, NASA located ICE with the help of KinetX using the Deep Space Network after discovering it had not been powered off after the 1999 contact. A status check revealed that all but one of its 13 experiments were still functioning, and it still had enough propellant for 150 m/s (490 ft/s) of Δv (velocity change). In early 2014, space enthusiasts started discussing reviving ICE when it approached the Earth in August. However, officials with the Goddard Space Flight Center said the Deep Space Network equipment required for transmitting signals to the spacecraft had been decommissioned in 1999, and was too expensive to replace. On 15 May 2014, the ISEE-3 Reboot Project successfully raised $125,000 through crowdfunding to re-establish communications with the probe. On 29 May 2014, the reboot team commanded the probe to switch into Engineering Mode to begin to broadcast telemetry. Project members, using the Goldstone Deep Space Communications Complex DSS-24 antenna, achieved synchronous communication on 26 June and obtained the four ranging points needed to refine the spacecraft's orbital parameters, data needed to calculate maneuvers required to bring the satellite out of heliocentric orbit. The reboot project successfully fired the thrusters on 2 July for the first time since 1987. They spun up the spacecraft to its nominal roll rate, in preparation for the upcoming trajectory correction maneuver in mid-July. However, a longer sequence of thrusters firings on 8 July failed, apparently due to a loss of the nitrogen gas used to pressurize the fuel tanks. The ISEE-3 Reboot Team announced that all attempts to change orbit using the ISEE-3 propulsion system had failed on 24 July. They began shutting down propulsion components to maximize the electrical power available for the science experiments. In late July 2014, ISEE-3 Reboot Project announced the ISEE-3 Interplanetary Citizen Science Mission would gather data as the spacecraft flies by the Moon on August 10 and continues in heliocentric orbit. With five of the 13 instruments on the spacecraft still working, the science possibilities include listening for gamma ray bursts, where observations from additional locations in the solar system can be valuable. The team plans to acquire data from as much of ISEE-3's 300-day orbit as possible and the project is recruiting additional receiving sites around the globe to improve diurnal coverage. They may upload additional commands while the spacecraft is close to Earth, after which they will mostly be receiving data. On 10 August 2014, ICE passed the Moon at a distance of approximately 15,600 km (9600 mi) from the surface and continued into heliocentric orbit. It will return to Earth's vicinity in about 17 years. A Delta 2 rocket launched from Vandenberg AFB, California successfully carried the first 4 Iridium satellites into orbit. A conjunction of the Sun, Mercury, Venus, Mars, Jupiter, Saturn and the Moon occurred.